Bid (in green text): The current highest buying price. Ask (in red text): The current lowest selling price. There are two currencies being used on Dispenser.tf market at this time: Mann.Co Supply Crate Key (TF2 Keys) and USD (Bitcoin). You can show or hide markets with the filter on the front page. Before you create any order, please make sure you are in the correct market. There are two or more markets for any items, one is for exchanging with key credit and another for exchanging with USD (Bitcoin). Please choose carefully so that you will not buy or sell an item for a currency you do not plan to use. Also, make sure you are entering the USD but not the BTC price for your items under the USD (BTC) market. Currently, a market is automatically created upon the first sale of an item. There is no way to create a market for an item pair that does not already existed, which means you cannot create bid orders for items that have never been sold before. To look for a market, you can use the text search located at the top menu. There are a number of tabs for filtering out and sorting markets. The filters also work within the search. Example 2: 'strange equalizer' - Equalizer in Strange quality. Example 3: 'unusual' - Every items in Unusual quality, items with "unusual" in name. Example 4: 'strange -part' - Every strange items excluding "part". The minus sign excludes a keyword. 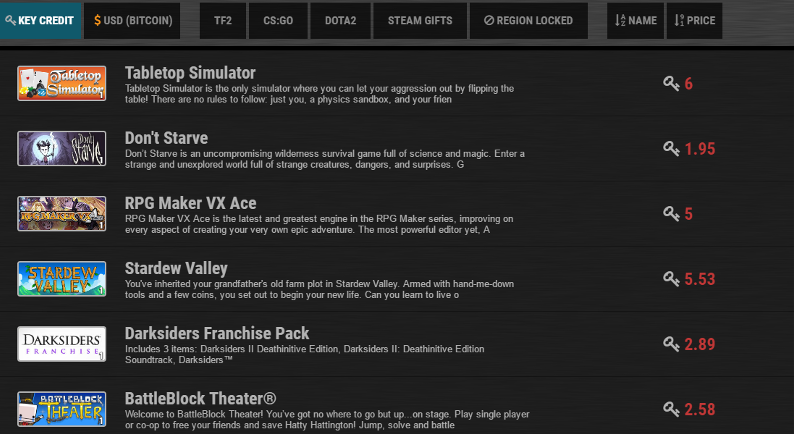 Example 5: 'counter strike global offensive' - CS:GO gifts, but no CS:GO items. Key credit is one of the main currency in the market. There are two ways of obtaining key credit: depositing keys or selling items. You will read on and learn about how to sell items in the market. This section will explain key deposit. You can deposit keys to the site with the "Key Credit" interface, which is located as the top item from the left side bar. The number on the tab shows your currently available key credit. Or you can access the page with this URL. Basically our system accepts any keys, including various TF2 keys and CS:GO keys, with the exception of CS:GO capsule keys. The rate for each keys is written on the page so please check carefully before you proceed. It may change anytime according to the market rate. If you wish to get more key credit for certain keys, you should deposit them to your shop and sell them in the market instead of depositing them as credit. For instruction of using the shop inventory, please read Deposit and Withdraw. Due to a change of CS:GO keys trading (see CS.net blog) from March 2018, CS:GO keys will be credited 7 days after deposit. You can check the amount of onheld credit on your credit page. CS:GO keys that are momentarily untradable will also be hidden from your shop inventory until they become tradable. 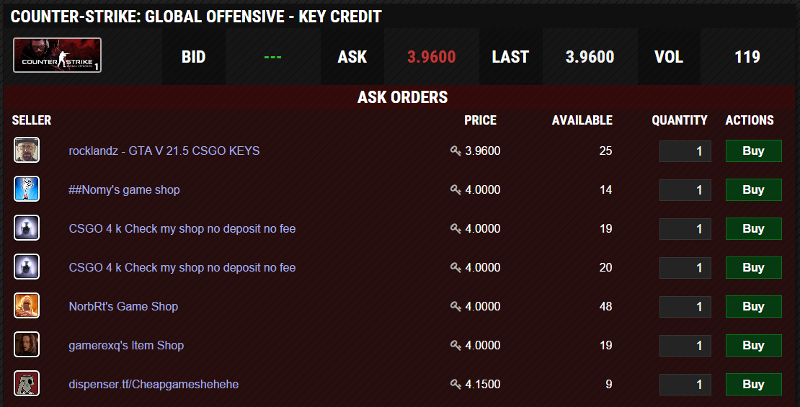 Keys in your shop inventory will also be used to create bid orders in the market. 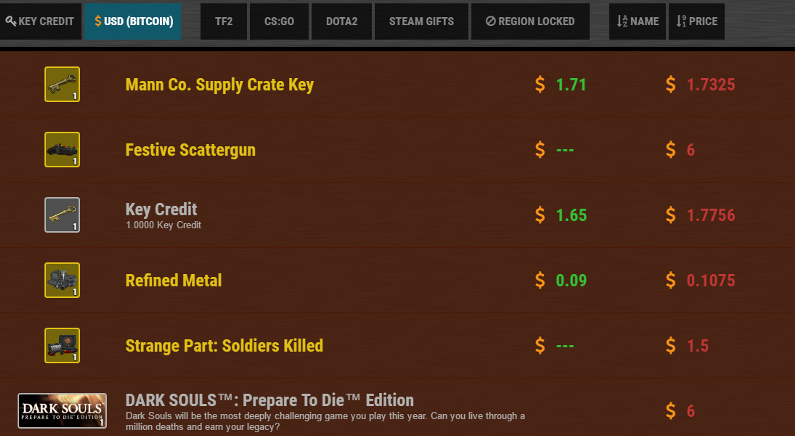 The system will look for TF2 keys in your shop to create your orders if there is no key credit. Keys withdrawal is also handled on this interface. However, there is no guarantee that all types of keys are always available for withdrawal. In which case, you could only choose from what is being available, regardless of what you have deposited to the system in the past. Order book is a list of bid and ask orders for an item pair. It gives you information about the price, demand and availability of that item. Bid orders are the "buying" side of the book while ask orders are the "selling" side of the book. The simplest logic of the order book is that a pair of bid and ask orders of the same price will match each others, resulting in an exchange of items. The fastest way to buy of sell an item is to create a matching order to the highest bid or lowest ask. To create an order, you first need to possess an item or a currency, and submit a form with the price and amount. You can click on any row in the order book to create a matching order for that row or fill in the information manually. Price: The price for each items you are buying or selling. The minimum price is 0.01 key credit or 0.0001 USD (BTC). Quantity: The amount you wish to buy or sell. Available: Your available credit (keys or Bitcoin) for creating bid orders or your available items for creating ask orders. Minimum price: The minimum price and price increment for this item. Fee level: Your current fee level. You can pay less fee for trading a higher volume. Please read Fee Table for details. Fee total: The total fee for your order if your orders go through. You do not have to pay any fee for creating or canceling orders. Order total: The total value of your order excluding fee. Grand total: The total value of your order including fee. Actions: Click when you are ready to create your order. For all ask orders across all markets, if you wish to take the top, your price must be at least 1% lower than the current lowest ask. Any pair of bid and ask orders with the same price will match each other, resulting in an exchange of items. When you create an order without an existing counter order, no item exchange will take place until a counter order from another party appears. If you create an order with a price that is "better" than the top bid or ask, any orders that is the same or better than your asking price will be matched, with the remaining amount left on the order book waiting for match. In this example order book, a bid order of key price (1.11) and amount (300) is created. The matching result will be as following. 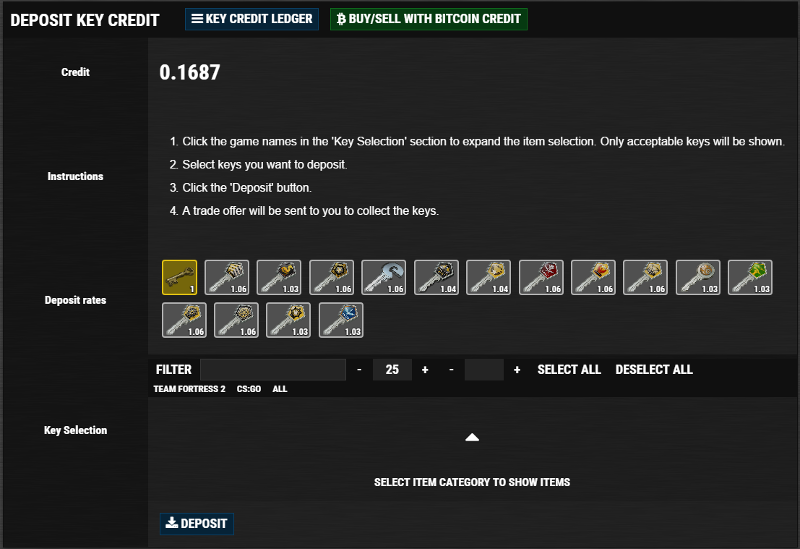 142 Falchion key will be bought for 1.09 key credit. 88 Falchion key will be bought for 1.10 key credit. An "bid" order of price (1.11) and amount (70) is created. For two orders of the same price, the one that is created earlier will be matched before another. You can access the "Orders" interface with the navigation bar on the left side. It is the third item in the bar. The interface shows the details of your open orders in all markets where you can cancel them with a button. It also shows the details of your filled and cancelled orders in the past. The interface of Steam gift market is slightly different from others. There are no bid orders nor the part of tool box for creating them. The reason for not allowing bid orders for Steam gifts is to prevent scammers from dumping fraudulently purchased gifts quickly in the market. You can only buy Steam gifts from existing ask orders. The seller of each Steam gifts will also be shown in this interface. It is recommended to investigate each seller's background and evaluate their credibility carefully before buying their items. We will not be responsible for any loss of purchasing revoked gifts. This is the fee structure of the Dispenser.tf market. Only sellers pay transaction fee for non-Bitcoin trades. The fee structure calculation takes volume from your market trades for the last 30 days and is updated every 24 hours. Your trading fee may vary every 24 hours. Bitcoin trade fee is calculated differently and has a fixed fee of 1% regardless of your fee level, and your Bitcoin trade volume does not contribute to your fee level.